As with auto accidents, truck accidents are often caused by human errors, and these errors commonly arise from the negligent actions of drivers – either truck drivers or other motorists on the road. Our Denver truck accident attorneys are dedicated to helping victims and their families obtain the compensation they deserve when negligence causes truck accidents. Truckers’ failure to comply with any state or federal trucking regulations, which can result in truck equipment malfunctions (and other risks and problems). At Bell & Pollock, P.C., our Denver truck accident lawyers are committed to seeking compensation and justice for the victims of truck accidents caused by any form of negligence. We will work relentlessly to hold negligent parties accountable, helping victims and their families pursue all available legal remedies so they can maximize their financial recoveries. Other parties, such as truck equipment manufacturers when defective equipment causes truck accidents or municipalities when poor roadway conditions contributes to collisions. Expert witnesses, such as accident reconstructionists, physicians, etc. Our lawyers proudly represent truck accident survivors, including families who have lost loved ones to fatal truck accidents. We understand that there is no amount of money that can ever compensate you for a permanent or catastrophic injury – let alone for the loss of a loved one. However, our lawyers also know that compensation from truck accident cases can be pivotal to helping people get through difficult times, recover from their injuries and/or deal with grief as they put their loved ones to rest. Contact an Experienced Attorney at Bell & Pollock, P.C. 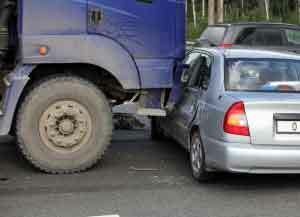 If you have been injured in a truck accident, you can count on the attorneys at Bell & Pollock, P.C. for experienced help advocating your rights and securing justice. Since 1984, our seasoned attorneys have been standing up to even the most formidable opponents, aggressively advocating our clients’ rights and helping them obtain the full amount of compensation they deserve.